There are many grief holes. There’s the grief hole you fall into when a loved one dies. There’s another grief hole in all of us; small or large, it determines how much we want to live. And there are the places, the physical grief holes, which attract suicides to their centre. Sol Evictus, a powerful, charismatic singer, sends a young artist into The Grief Hole to capture the faces of the teenagers dying there. When she inevitably dies herself, her cousin Theresa resolves to stop this man so many love. Theresa sees ghosts; she knows how you’ll die by the spirits haunting you. If you’ll drown, she’ll see drowned people. Most often she sees battered women, because she works to find emergency housing for abused women. She sees no ghosts around Sol Evictus but she doesn’t let that stop her. Her passion to help, to be a saint, drives her to find a way to destroy him. 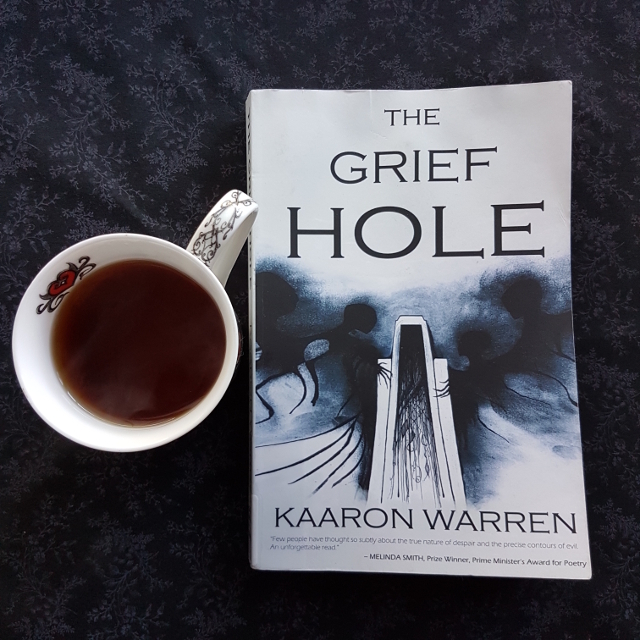 Kaaron Warren is a multi-award-winning author and The Grief Hole shows why. I’ve held off reading her work for a while, since horror is really not my jam. However, when The Grief Hole was nominated for a Ditmar Award, I knew it was time for me to dive in. At first glance, the book looks like supernatural horror. Theresa can, after all, see ghosts. These ghosts reflect the way a person is most likely to die. However, the ghosts are not the scary part. Although they’re keen to gather more of their number, they are ultimately powerless background noise. As the story progresses and Theresa comes to understand things better, they become somewhat more sympathetic. Instead, what is clear from the start of the novel is that it’s about human monsters. The story is divided up into Interventions. These are times when the ghosts around someone are so numerous or otherwise strange that Theresa is prompted to act: to commit some deed that results in death or incarceration for the perpetrator. She’s very clear she acts out of a sense of justice, rather than revenge. However, this doesn’t make Theresa a good person by any stretch of the imagination. Instead, we’re shown all the ways that Theresa herself is monstrous. She thrives on the suffering of others, often poking at emotional tender points and claiming it’s to help. She frames newspaper smeared with blood from her cousin’s suicide, looking on it as somehow inspirational. She keeps files of atrocities reported in the media. And she jumps to conclusions about what her ghosts are trying to tell her, acting on information that is sometimes incomplete or incorrect. She shows how good intentions are sometimes self-delusion. While the ghosts aren’t exactly central to the story, I still refused to read this story after dark. The author does a fantastic job of creating an oppressive atmosphere that lingers over the reader as much as the characters. Towards the end, the story took on a dark fairytale resonance, somewhat reminiscent of the Brothers Grimm or the story of Bluebeard. This is enhanced by the characters, some of whom feel otherworldly. Theresa’s aunt Prudence is a prime example. Her association with the colour red and the way she always carries balloons with her gives her the feeling of a hallucination, only kept partially at bay by the fact she’s visible to people other than Theresa. I can’t say I enjoyed The Grief Hole; it is not a book intended for comfort or enjoyment. However, it is a well-written and thoughtful examination of grief and altruism. It won three major Australian awards this year and most certainly deserves the accolades it has received.